In the mid 1970’s I had a brief career as a professional sports photographer. 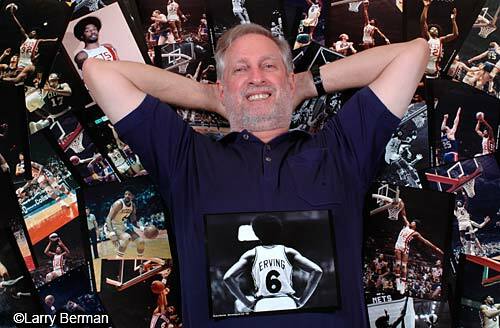 During a four-year period, I was staff photographer for the New York Nets of the ABA (American Basketball Association), did assignments for Converse and Spalding, and did work to various magazines including Newsweek, Sport, Black Sports and Hoop – the NBA programs. Almost a memory in my life’s photographic odyssey, I happened to add a few black and white photos of Dr J (Julius Erving) to my BermanGraphics.com web site.. Inspired by the response, I dug through some boxes in the basement and started scanning my old basketball film. The photographs were originally taken with two motorized Nikon F2 camera bodies and assorted Nikon lenses. My main basketball lens was the 85mm f1.8 and the 50mm f1.4 for a slightly wider view. Over a three-year period I photographed each Nets home game practicing and practicing. It reached a point that I could follow focus with the 85mm lens, wide open at f1.8, with the subject filling the frame. I picked up a used Bessler Topcon 180mm f2.8 lens and replaced it with the Nikon when it became available. That was my lens for the opposite end of the court. The film I used was High Speed Ektachrome Daylight pushed 1¼ stops for Nassau Coliseum and High Speed Ektachrome Tungsten pushed 1½ stops for Madison Square Garden. All indoor color photos were taken at 1/250 second. Tri-X was used for black and white and was pushed 1 stop to ASA 800. I developed all my own black and white as soon as arriving home after each game. The transparency film was dropped off at a custom lab I used and picked up the next day by noon. At the time I was making the photographs, and for years later, printing the photos never entered my mind, as there was no inexpensive way to print them, and no way to effectively market them. Photoshop and the Internet have opened the doors that were previously closed to me. A few years ago I had purchased a Polaroid Sprintscan 4000 dedicated film scanner to scan client’s slides for their web sites. Now putting it to use, I started scanning my old slides at full 4000 pixels per inch resolution and began working on the digital files with the intention of making prints to sell from a web site I designed expressly for the sports nostalgia at www.BermanSports.com. This is now the new home for those classic images that have been hidden away for the past 25 years. My full resolution scans create files that are approximately 62 megabytes in size. Since the slides are 25 years or older, there is a fair amount of embedded dust. Not willing to risk having them handled by a service bureau, I’m depending on Photoshop 7’s new Healing Brush to clone out the offending spots. Though I’ve spent an average of an hour preparing each full size file, that’s a fraction of the time I would have had to spend doing it any other way. For my print process, I’ve come to depend on the Fuji Frontier Printer for sizes 10x15 or smaller. The direct from digital modified type C process uses conventional Fuji Crystal Archive paper and is a true photographic process. The Crystal Archive paper has a 60-year life expectancy. For larger sizes, I depend on a local custom lab that makes Lambda prints. Those are also direct from digital prints using the same Crystal Archive paper. With all the controversy of the ink jet printing process, and the failure of some photographers to pay attention to the archival qualities of their choices of paper and ink set combinations, I feel totally comfortable with my choice of output and confident that my photographs will outlive me. I also include a certificate of authenticity with each order to help others understand what my process is. Even if the technology for scanning and printing had existed 25 years ago, there still would have been a problem of actually getting people to see my photographs. The key is understanding the Internet and it’s promotional capabilities. Every photo I put on the Internet has either my name, or my web site URL as a copyright added in Photoshop as a text layer. That way if someone wants to find me, it’s as easy as going to Google and typing my name in. With all the boxes of slides and prints sitting in closets or basements, I’ve shown one way to resurrect the past. Besides scanning your own slides there are two options I recommend. If you don’t own a film scanner, consider Kodak Photo CD’s, which are reasonably priced ways to get up to 100 slides on a CD. But you do need an image-editing program that can open and work with the PCD files. Another option is the Fuji Frontier (model 370) printer, which has the capability of scanning at 3000 pixels per inch, if you ask for a scan for a 10x15 inch print. Scanning prints is an option if you own a flatbed scanner. I recommend scanning at a minimum of 300 pixels per inch for maximum detail in the print, though you really shouldn’t try to print a larger size than the print you scan. For me, this has been a very rewarding project as it’s brought me back to a time in my past when I had fewer worries and daily life was a lot of fun and a creative challenge.